He belongs in solitary confinement for the horrors he's brought to this country, not on TV! pr Wrote: He belongs in solitary confinement for the horrors he's brought to this country, not on TV! Why? What has he done to be placed in solitary confinement, I use to listen to him on the radio, other than being a little preachy, I heard no horror from him, he said he is for smaller government, less taxes, less government meddling in the private lives of citizens and is an avowed Constitutionalist, he is an opinionated talk show host, no better or worse than any of them, they all preach the Agenda of the network that hires them. BTW, he is no longer on network TV, I think he is on sirus? or some type of satalite tv. He is nothing more than a charlatan, phony, actor, someone who would and will take any position on any subject that will make him money and give him notoriety JC you're too smart to be taken in my this clown I thought! Never said I was taken in but was wondering why you attributed so much mayhem to just one radio talk show host, I also believe in smaller and less meddlesome government, I also think we as citizens are taxed way too much and get little back in the form of good governing policies, I think that the two party system in this country is a joke, now I have had these opinions before I ever listened to Beck. You, yourself are no dummy either to think that if a person like Glen Beck were to be squirreled away in some place where sharp objects are not permitted, that those thought and opinions would go away, you know better. Unfortunately there are way to many people in this country who quote people like Beck, Palin & Rushbo and actually believe what they have to say only because they reinforce their deeply held fears and prejudices. Personally, other than Palin, I don't think the other two believe in anything but money and all she believes in is herself. 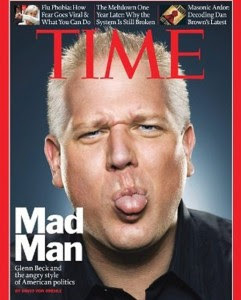 Unfortunately, there IS one fact about Glenn Beck that's true. He never attended college, and barely made it through high school, but he made $32,000,000 in 2010. For the first six months of 2013, his earnings went up sharply - to $90,000,000 - and his net worth is $150,000,000. I'm a college graduate (Economics degree) and I taught college level Economics for six years, but my annual earnings (and net worth) are a hell of a lot less than the money that Glenn Beck has.